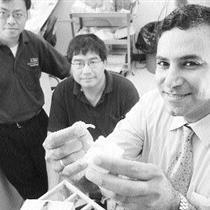 ISR alum Jie Chen, a 1998 ECE Ph.D. graduate and associate professor of electrical engineering at the University of Alberta, has developed new technology that helps regrow human teeth. Chen and his colleagues Tarek El-Bialy and Ying Tsui have developed a patent-pending technology that enables the regrowth of teeth and dental tissue. The trio have designed a tiny wireless device for insertion into a patient's mouth which can gently massage the gums to stimulate the growth of the tooth root. The device is still in the prototype stage but is expected to be on the market within two years. It also will be capable of straightening up smiles by stimulating jawbone growth. Chen's current research interests include nanoscale circuit design and applying nanotechnology for biomedical applications. He has published more than 50 scientific papers in refereed journals and conference proceedings, and has co-authored a book on genomic signal processing and another book on circuit and system design for digital video coding. He was also nominated as a Fellow of Canada’s National Institution of Nanotechnology. While at Maryland, Chen was advised by Professor K.J. Ray Liu (ECE/ISR).